Planning on taking a trip to see all that Alaska has to offer? Better call up UPack and put your belongings in pods storage then, you'll be gone a long time! If you've never been to this massive state, you might think it is all ice, snow and cold but actually there is a great deal of natural diversity within its borders. Would you have ever guessed that Alaska is home to a rain forest or that the average daily temperature of Juneau is actually above freezing? And if you think states like Wyoming are sparsely populated, wait until you see what 1.25 people per square mile looks like! 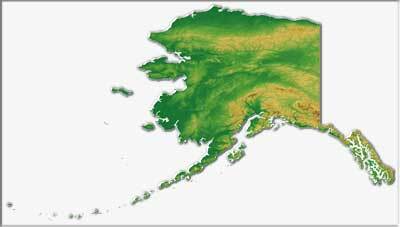 Alaska is the largest state in the United States, with an area of 586,000 square miles -- roughly twice that of Texas and roughly one fifth the size of the lower 48 states combined.That's plenty of room for its population of 710,000. Alaska's tidal shoreline is estimated at more than 47,000 miles, more than that of the other 49 states combined. Anchorage, with a population of about 280,000, is Alaska's largest city. You can find all the conveniences of a similarly sized city such as pods storage units, fast food chains, supermarkets and so on. Unlike other cities in the continental U.S. though, you will also find the occasional moose-caused traffic jam or lost and confused bear wandering around. It is so much bigger than other communities in the state that other Alaskans like to say Anchorage is only 20 minutes from Alaska. More than half the state's population lives within a radius of 50 miles of Anchorage. The nearby communities of Eagle River, Wasilla, Palmer and Girdwood (Eagle River and Girdwood are officially part of the municipality) have growing populations of Anchorage commuters. Fairbanks until recently was the second largest city, (it still is if you include the surrounding metropolitan area), followed by Juneau, the state capital. However, in 2013, Juneau assumed second place with a population of 33,064, compared with 32,204 for Fairbanks. The next largest communities are the regional centers: Barrow, Bethel, Dillingham, Ketchikan, Kodiak, Kotzebue, Nome, Unalaska, and Valdez. Homer, Kenai, Seward, Sitka, Skagway, Soldotna and Cordova also fall into this collection of towns and villages. Ketchikan has a population of 14,000; the other towns have between 1,000 and 9,000 residents. Alaska has 39 mountain ranges and 17 of the 20 highest peaks in North America. Major mountain chains and mountain ranges are the Alaska Range, which includes Mount McKinley as well as several volcanic peaks that can be seen across Cook Inlet from Anchorage; the Brooks Range in northwest Alaska; the Chugach Range around Anchorage; the St. Elias Mountains including the 18,000-foot Mount St. Elias (North America's second highest peak, Mount Logan, at 19,545 feet, is located on the Canadian side of the St. Elias Mountains); and the Fairweather Range, which stretches down into the southeast panhandle. Alaska is part of the "Pacific Ring of Fire," a string of volcanoes that stretches from Asia into North America. It has more than 100 volcanoes and volcanic fields, many of them in the Aleutian Islands. A 1912 eruption created the "Valley of 10,000 Smokes" on the Alaska Peninsula and was the largest 20th century eruption in the world. Mount Spurr and Mount Redoubt, about 100 miles west of Anchorage, erupted in the 1990s.The Mount Spurr eruption in 1992 brought activity to a standstill when an inch of ash rained down on the city. The Yukon River, which originates in Canada and is the third longest river in the United States, winds for 1,875 miles through Alaska. Alaska has more than 3,000 rivers and 3 million lakes, leaving Minnesota, "land of 10,000 lakes," far behind. Southeast Alaska, with its Inside Passage familiar to cruise ship passengers, includes more than 1,000 islands as well as a rainforest. The 16.8-million-acre Tongass National Forest is the largest forest managed by the U.S. Forest Service. The Kenai Peninsula, directly south of Anchorage, contains the towns of Seward, Homer, Kenai, Soldotna and Seldovia. Alaska has about 280 communities altogether. Most of them can be reached only by air or water. Alaska is part of the continental United States but is not one of the contiguous 48 states. Alaskans refer to the other states within the continental U.S.A. as "The Lower 48." Alaska is divided into boroughs instead of counties. In the mid-1990s, apparently the last time the state counted, there were 16 boroughs.